I’m looking for an orange Target cat with yellow stripes and whiskers. He is about 13 inches. 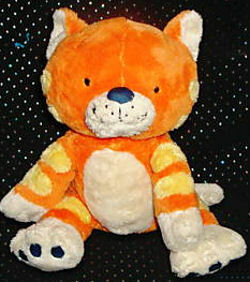 I am looking for this orange and white kitty with yellow stripes from target for my 7 year old granddaughter. She received one on her 1st birthday and now the little guy is falling apart and she loves him so much. She would be so thankful. Please be sure you Contact US with an email address that is correct, and that you will be using for a long time!! We can’t help you if we can’t contact you!! ebay #390534526418 buy now or make offer options. Good Luck! Thank you so very much for taking the time to let’s know, I just bought him and he’ll arrive in 5 days! My granddaughter will be ecstatic!! I never thought I would ever find another one!! “Thank you for taking the time to “let” me know”, my phone auto corrected . I most definitely will and thank you again!! I am looking for the same kitty. My seven year old has had it since he was a baby and we’ve lost it. : / He’s so sad. I will help you search. I still look periodically, just to see if there’s another one out there, but I’ll look more often now that I know another child needs that beautiful orange kitty.